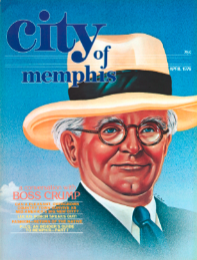 Founded in April 1976, Memphis magazine is settling into its early forties, continuing the work of enlightening, informing, and entertaining readers. Thanks to dedicated local ownership and a staff committed to journalistic excellence, Memphis has established a tradition of independence and editorial quality second to none in the Mid-South. Over the past 42 years, Memphis has won scores of national and regional awards for editorial and design excellence, including the Society of Professional Journalists' Distinguished Public Service Award in 1984. (Memphis is the smallest-circulation magazine ever to have won this honor.) In recent years Memphis magazine has been the Gold Medal Winner in the General Excellence category of the City and Regional Magazine Association Awards. Every month, more than 60,000 readers look to Memphis magazine to provide them with in-depth coverage of every aspect of life in the Bluff City. Those readers represent the best and brightest in our community, the movers and shakers who help make this city — the corporate home of FedEx, the cultural capital of the Mississippi Delta, and, of course, the birthplace of rock-and-roll and the home of the blues — the very special place it is today. We hope you enjoy reading Memphis magazine as much as we enjoy creating it.